The unbeaten run of the Russian women's volleyball team at the FIVB World Grand Prix has been broken by the team from South Korean. ­The first defeat came only in the event’s third round in Tokyo, Japan, with the Russians confidently winning six of their previous games. Vladimir Kuzyutkin’s charges failed to cope with the Koreans, led by Kim Yeon-Koung, who scored an impressive 31 points. Russia led the game 2-1, but failed to capitalize on the advantage, going down with a final score of 3-2 (25-22, 17-25, 20-25, 25-23, 15-11). ”As I said at the press conference on Wednesday, Korea is a very good team. We lost today, but it's not the end. This is a long tournament, so we have to keep same level for each game. But we have to learn something from today's game. 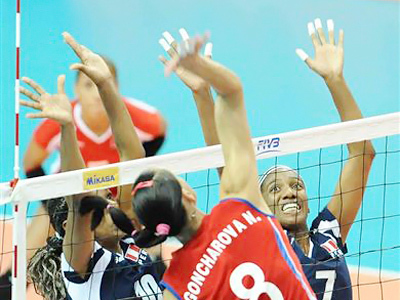 Even though we lost today, we won't feel down because of it,” coach Kuzyutkin told FIVB official website. Team Russia were not too upset by the loss as the result was still good enough to guarantee them a place in the World Grand Prix finals alongside hosts China. The tournament’s deciding game will take place in China’s Special Administrative Region of Macau at the end of August.